Venus, Lunar’s budget brand, took off like a rocket after its 2012 launch. Early reviews and the Preston manufacturer’s dealer network were positive. For 2014, the line-up shed the tiny end-kitchen 320/2, but changes to the remaining three models were minimal. These include a shift from Whale to Truma heating, and from the Al-Ko chassis to BPW’s and both bring benefits. The Truma Combi 4E is more powerful, while fans of the BPW chassis – with the Swing V-Tec axle and a shape built to deter snaking – reckon it’s the best available. The 380/2 is a two-berth whose layout (parallel seats in front, an offside kitchen and an end washroom) is popular with ralliers. The 995kg MTPLM and less than 6m length make it a good match for small tow cars, such as the 1.6-litre Peugeot 208. Like other entry-level vans, Venus has a three-quarter height moulded front panel with a single large window. At the rear wall are a flat aluminium panel and a moulded bumper housing the road lights. It is unusually slim at 2.12m but this keeps the weights low. New blue-and-silver graphics make it look sporty. The front and rear stead nuts are easy to access. All the services connect on the offside; the battery box houses the mains hook-up socket, and the water inlet is alongside. The waste-water drains and toilet cassette are also here, rear of the axle. The furniture, in light-oak effect, is plain but pleasant and there are attractive touches, such as 230V corner lights, secure window catches, pelmets and rooflights. All the windows have flyscreens and blinds. The soft furnishings reflect high street trends: the stylised leaf pattern of the colourful curtains and scatter cushions stands out against the tweed-look upholstery. The parallel lounge has no central chest, and there’s no escaping the van’s svelte figure: the space is narrow. Condensation boards behind the backrests help in cold weather, and four directional LED spots provide ample light. The free-standing dining table measures 86cm x 55cm, which is ample for two, but would prove a squeeze with dinner guests. Also, without a chest of drawers or an occasional table in front, you’ll likely have to retrieve it regularly from where it’s stored in the wardrobe. The Venus boasts sprung upholstery and aluminium seat frames, unusual features at this price. There’s a single mains socket and TV/12V points at the front, while blown-air vents in the bulkhead and the nearside sofa box keep the space warm. Our test model was fitted with the optional Premium pack (£399), comprising attractive alloy wheels with the Venus logo, a full flyscreen for the two-piece entrance door, a hitch stabiliser, radio/CD player and a spare wheel. The galley is smaller than in the 2013 version; it was compromised to make room for larger twin beds in front. The specification level is as you’d expect, though, given the van’s size and price: things are simple and compact, but good enough. The kit list is led by a combined oven/grill, a three-burner gas hob and a Dometic fridge, which was moved from the main galley unit to the dresser opposite. It is short on worktop, but a 33cm-long, flip-up extension alleviates this. There’s also workspace on the dresser, which would have been ideal as a TV stand, because it has its own mains socket, but no aerial connection, which is in front. Other equipment includes an oblong stainless-steel sink, with a clip on plastic drainer, a further three-pin socket and good storage space. Oddly, though, the cutlery drawer is sited low down, beneath the shelf in the large cupboard. The washroom isn’t huge – although it stretches across the full width of the 380/2, it is only 70cm deep. The ceiling light is operated by a pull cord, which reduces fumbling for switches in the dark. The basin is mounted against the rear wall and is plenty deep enough for washing. A large mirror is hung directly above it, and a small cupboard for toiletries is below it. Legroom is ample around the swivel-seat toilet, and we’re pleased to see the washroom is fitted with an opaque window. The separate shower cubicle has a bi-fold door and a moulded tray, while the showerhead bracket is mounted high on the wall. But water splashes off decorated wallboard rather than a fully lined cubicle. The 380/2 was criticised for failing to offer long single beds when it was launched, but we’re pleased to see that it now offers beds that are 1.92m and 1.8m long, respectively, the longer one on the nearside. In order to do this, the designers had to rearrange the layout. For those preferring a double bed, the slatted base is slid from the front bulkhead, but the slats are not mounted in secure runners. There will inevitably be to-ing and fro-ing as they fall from the runners when the double bed is made up or undone. The shelf at the front is ideal as a ledge for specs, books and cups of tea. There are plenty of overhead lockers, which have shelves and open on impressively chunky hinges. Between the kitchen and the washroom is a tall wardrobe and, below it, a cupboard with shelves. It may be tall, but the wardrobe was narrowed to make room for longer single beds. The dining table is stored here. The seat bases can be lifted and are supported by spring cantilevers, allowing easy access to the ample storage space inside. Unfortunately, there are no exterior hatches for outdoor access to kit inside either. That is a shame, because you’ll have to lug bulky items through the van to store in them. Space is reduced under the seats by the mains unit on the nearside and the Truma Combi boiler on the offside. The Combi’s controls, above the main door, are the confusing, twin-dial panel and not the latest LCD version. 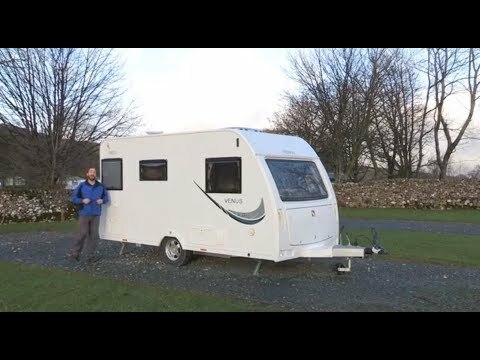 For a no-frills tourer, the Venus 380/2 gets a lot right, benefiting from smart styling and good specifcation, especially with the options pack. It’s narrow, which makes the living space cramped, but it’s a lot lighter than rivals in this sector. It makes a lot of sense for couples whose hearts are set on a box-fresh, new tourer and have a small tow car.